On discovering a leading man on a college campus for the story of 18-year-old deciding who he wants to be. 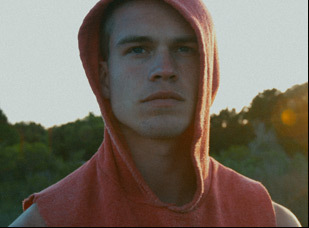 “I was just walking to my car after class one day and [Daniel] stopped me and kind of just threw me into this world,” laughs Slaggert, who has already booked his second prominent feature role in the upcoming horror film “Wish Upon” after appearing in ad campaigns for Calvin Klein and Versace following his chance encounter with Peddle. It isn’t just Slaggert who Peddle throws into the deep end in “Moss,” or the rest of the largely nonprofessional cast for that matter, but audiences as well, thoroughly immersing them in the bewitching spirit and culture of Carolina Beach, where visitors like Mary (Christine Marzano, the rare ringer in the group) come to escape from a world that moves too fast near the tranquil water and exotic fauna while its longtime residents like the titular 18-year-old, played by Slaggert, yearn for more excitement than can be found in nature. Set during the course of Moss’ birthday, in which he’s sent across the river by his father (Billy Ray Suggs) to get his grandmother her medicine, the film operates as both an often breathtaking travelogue of the marshlands and a moving story of reconciliation in a number of different forms as Moss makes peace with his place in the world, geographically and emotionally, following the death of his mother that left a chasm between himself and his dad. “Moss” is abound in local flavor, as Moss frequents convenience stores that sell worms for fishing alongside Mountain Dew and the riverboat run by his harmonica-playing, weed-dealing friend Blaze (Dorian Cobb) appears to be cobbled together from post-industrial detritus, but his journey to find his own identity when so much of it has been formed by where he’s grown up hits you no matter where you live. During the L.A. Film Festival where the film recently premiered, Peddle, Marzano and Slaggert reflected on how being in a special place led to making a special film, though not without some obstacles thrown in by the wild, and embracing limitations to find more creative solutions. Daniel Peddle: Carolina Beach is a small island off the coast of Wilmington, North Carolina and I’ve been going there ever since I was a child. It’s really steeped in history. It’s actually where the Civil War started to come to an end – Fort Fisher, which is the Southern-most tip of the island was lost in one of the largest maritime battles. Then ironically, the island was bought by one of the largest African-American landowners, so it was owned by someone who used to be enslaved, and it has a fascinating vibe to it. Now, a lot of surfers come there and you just get this really heady brew there and the place itself is just fantastic, the way it looks, so I knew I wanted to make a film there for a long time. I’ve actually written two scripts that are set there and when I met Mitchell, I knew there was a perfect opportunity to capture this place and create a character that will be a tour guide, if you will, through this amazing environment. Mitchell, you had never acted before and now you were a lead in a film. Was this an intimidating prospect? Mitchell Slaggert: Somewhat, and I don’t want to cuss, but I never half-blank anything I do [laughs], so I really just dove right into it. For me, [inhabiting the character] was just going back to my early high school days. I spent a lot of time out in the backyard just hanging out in the woods and just being like one with nature because we’re all part of this earth. I got some [acting] training under my belt, and then once we came down to the nitty gritty and started doing it, nerves started to set in a little bit, but after a while, I warmed up to it. Daniel Peddle: Mitchell went to school in Wilmington, so it’s near Carolina Beach and he was familiar with the terrain, and actually Christine flew in from a bigger budget shoot she was doing in Bulgaria. My DP Juri [Beythien] is German and had never been to the U.S. before, so this was the first time he had seen this place and had been in the U.S. at all, much less experienced it through the lens of this weird little island, so having the combination of the people that were familiar with the terrain and the people like Christine and Yuri who had not seen it, helped me maintain this kind of freshness about the place. We integrated in a lot of local people that act in the film or they play themselves more or less in the film and that helped everyone understand what kind of vibe we were going for because once you meet people that are from there, you know what it is that makes that place special. Mitchell Slaggert: Yeah, [Daniel] grew up there, so he knew all the beautiful spots and the places we wanted to go shoot, like they had burned some of the forest to clear out some of the foiliage, so we’d go out there and he knows this place like the back of his hand, so it really helped put it all together. Christine, how did you come on to the film? Christine Marzano: I met Daniel a few years ago when I was still in college. He came to Princeton to scout men for the Abercrombie and Fitch campaign and he scouted my boyfriend at the time, but we’ve been in touch ever since. When he said he was working on this film, I’d always followed his documentaries and the art that he does and I’ve always thought he was a ridiculously talented, so when he mentioned the film, I said I’d love to be a part of it. For me, [this character of Mary] was more of the idea of being the outsider. Mary isn’t from there, she’s passing through it and there was a lot of that in my actual experience too. I’m not from there, I’m not from the South, but [Mary] desperately wanted to have that connection with nature and maybe it wasn’t the easiest connection to have, but she was trying. Still, you look surprisingly comfortable when that snake crawls up your arm. Daniel Peddle: It was the most docile snake ever. It was fully prepared. It was very, very docile. Let’s put it that way. Was this an unexpectedly physical shoot for you guys? Christine Marzano: I had just come from shooting an action film, so we were doing stunts and I was actually pretty well-prepared. Daniel Peddle: They never complained, either of them. And they were doing so many things that were outside the normal box of making a film. I mentor a lot of young filmmakers and I tell them it’s not a career, it’s a life and I feel like that’s what happens on a set too. You go into it with these 20 days, or [in this case] these 25 days, and it just becomes an intensified living experience. Everything gets amplified and even when you’re done shooting for the day, you’re still on that high. Obviously, [the actors] gave terrific performances, but it’s not just about that. It’s also about the process for all of us because I think of it as making art, so having people that were willing to put their hearts and souls into it and lift stuff when we needed to, made a huge difference. How big a crew did you have? Daniel Peddle: It was a total skeleton crew. There were only four of us, plus our assistants, so we did a lot with a little. When you’re working with restrictive budgets and you have fewer resources than maybe you want to have, you end up being far more creative and if you’re open to it, you can turn those very obstacles into gems for your film. That happened a lot for us. You get a feeling of the authenticity and the soul behind the movie, which is of course, not easy to achieve and I’m very proud of that. Daniel Peddle: And it was cold that day. Christine Marzano: I had to have blankets with me at all times. Daniel Peddle: It was 40 degrees. Christine Marzano: It was freezing that day. The water was insane. Mitchell Slaggert: We were just on the boardwalk and it was like a clear view just straight to the ocean. The wind was coming on and we were freezing. Daniel Peddle: And the sun was setting. Did Mitchell and Christine meet before filming? Given the relationship where it’s this chance encounter, how much did you want to know each other before shooting? Mitchell Slaggert: Well, [Daniel] spoke really highly of [Christine], so of course I wanted to know her and also the fact that she was an experienced actor, I wanted to pick her brain for everything she had. She really expanded my whole mindset of acting, [talking about] my micromovement eye details and I never even thought of that, so it was a blessing that Daniel knows her. Mitchell Slaggert: Yeah, I was like, “Can we shoot that again?” [Christine laughs and rolls her eyes] [There was another day when] we were on a flat-bottom boat with four-foot waves one day and the sound guy Justin [Fox] was hiding his mic because waves were spilling over this boat. Daniel Peddle: He was literally curled up in a fetal position and he wasn’t getting sound. Mitchell Slaggert: Yeah, because the boat was rocking back and forth, and thank God [we had] a really good captain who was able to manage us and get to shore. For a second there, it seemed like he might just abandon ship to try and get away. Daniel Peddle: Yeah, this is a very moody river and when I wrote [the film], I thought “Oh, these are going to be beautiful scenes.” I never really thought about how complicated it would actually be to shoot them on the river. We had to choreograph a lot of boat movements and [other] crazy stuff to achieve [this] with very limited resources. My friend said, “That last shot in your film, in a Hollywood feature, that would be a half a million dollar shot,” so we worked a lot with a little. Mitchell Slaggert: Yeah, it’s called the Cape Fear River for a reason. Daniel Peddle: That’s him playing the harmonica, by the way. How did that sequence come about? It really gives a feel for the place. Daniel Peddle: I bike all the time wherever I go and this is a crazy place to go biking because you can actually bike in the woods, which is pretty rare. There’s a lot of really, really backwoods type residential areas in this neck of the woods and a certain type of Americana you don’t see very often, so I thought those bike scenes would be an amazing way to get us through those areas in a concentrated form. You mentioned before turning obstacles into gems for the film. Were there any surprises that came up during shooting that you’re happy are there now? Daniel Peddle: This incredible scene with the owl [that Moss lets loose] was a total surprise. We had no idea which way the owl was going to fly and we only got to do it twice because the owl’s not allowed to fly off its leash more than that or it gets confused. The second time that it literally flew right over the camera is one of my favorite things in the movie and that was just by chance. But we had lots of things like that happen. More so in the casting process frankly – things that would happen where people would come into the film that we weren’t necessarily expecting, but we made room for them because they were amazing. Mitchell Slaggert: Yeah, me and Billy [Ray Suggs] [really] have a father-son relationship. He’s like a mentor and I look up to him and also we were able to get some gorgeous shots like as we were caneoing down the Cape Fear river, we’d get this Natural Geographic shot of like a 10-foot alligator slowing sliding right in. Daniel Peddle: Yeah, that was incredible. Mitchell Slaggert: Coming right down below and [we had] a gorgeous sunset on the last day where Blaze is playing the harmonica, it was just like God was waving goodbye to us. Like “Here you go, congratulations on your movie.” It was amazing. “Moss” will open on July 6th in Los Angeles and New York. Interview: Richard Levine & Jared Ian Goldman on Not Giving Audiences an Easy Out with "Submission"
L.A. Film Fest '17 Interview: Sam Hoffman on Getting Serious with "Humor Me"